At the end of January, beginning of February an anti-Islam movie by the Dutch populist politician Geert Wilders is due. Prime minister Balkende is seriously preparing for a global crisis; the government summoned Dutch embassies in Muslim countries to prepare for the worst; ‘different cultures’ in the Netherlands are asked for a wise and calm response. This may become The art work of 2008. I’m not sure whether I should feel pride or shame of the fact that the populist voice has discovered the power of art and images. Was I ever worried that art might have become obsolete, upper-class elite, abstract avant-garde or intellectual nihilistic? Well, if it is any comfort, art is real politics today, more than ever. Submission, by Theo van Gogh and Ayaan Hirsi Ali; Sooreh Hera depicting Muslim prophets as homosexuals; the Danish cartoons; even the media images of the 9-11 attacks should be considered as ‘great works of art work according to Damien Hirst‘. What disturbs however, is the over confidence and know-it-all attitude or these works. What they lack is a sense of uncertainty, of not knowing the truth, of asking questions rather than providing easy answers, of approaching the world with an open mind. I often catch myself defending my own country. But do I really think it’s a good place? Or did I just grow up believing it is? I’m thinking about Lise Harlev whom I met at the Momentum 04 Biennale in Norway. Her work ironically plays with these populistic, slogan-like, rhetorics. 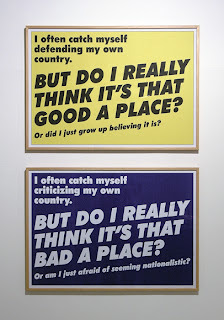 But rather than confirming their two dimensional statements, she replaces the slogans with personal questions. 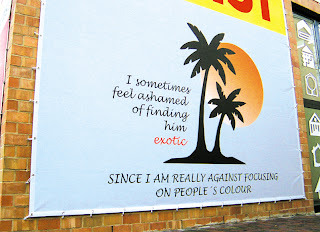 The posters have this special quality of her personal uncertainty, of NOT knowing it all and asking questions on identity rather than providing easy answers.